This Black Leather Office Chair offers affordable style and comfort. The luxurious black leather upholstery is worthy of an executive boardroom or personal office. With this cozy, luscious seating in the workplace, anyone can stay happy on the job and look forward to work. 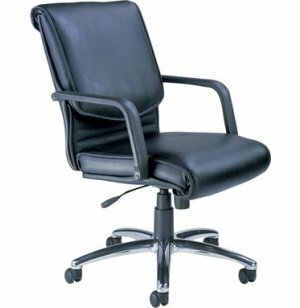 To give hard-working professionals the ergonomic support they deserve, these leather swivel chairs have a number of adjustable features. The swivel seat can be positioned via pneumatic height adjustment, adjustable tilt tension and tilt lock. This combination allows each person to find their ideal configuration. 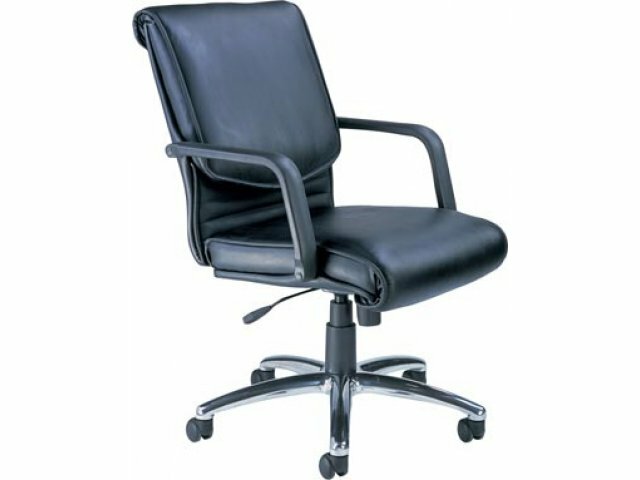 These leather office chairs provide the lasting comfort that lawyers, accountants or computer programmers need to stay focused and maximize productivity throughout the workday. Professional Elegance: Supple black leather upholstery promotes comfort and class in your office. Sleek Support: The cast aluminum five-star base has a chrome finish which gives this chair a polished appearance. Perfect Fit: A swivel seat with pneumatic height adjustment, tilt tension control and tilt lock helps each person find their ideal position. Arm Support: Black nylon loop armrests facilitate natural positioning for comfortable typing.